11th day of Lancent, year of the Wererat. Three days before your marriage to princess Viera. You are restless at night and seem to have difficulty falling asleep. When you eventually surrender to dreams, visions beset you. Mesmerizing and confusing ideas with distorted shapes and colors. Suddenly the vision becomes clear as water. A silhouette of a large, unkempt castle looms before you. In front of the castle stands another, much smaller silhouette. A man in a worn-out gray robe, leaning against a staff crowned by a shinning blue crystal. You don�t need to see the face hidden under the grey hood to know who you face. Mr. 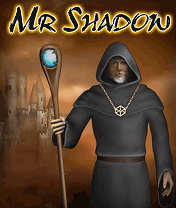 Shadow - an old and mysterious figure. A magician and a traveller. Blessed by some, hated by others. He is said to be a weaver of events in time and space. It is he, who is believed to stand behind even Kings and Queens decisions. He acts as he does and it is impossible to say, whether he follows his own motives or foresees a higher cosmic purpose towards which he weaves events. This all is flashed through your mind, as the figure begins to speak: "Young prince! Hear my words. Your fiancee, princess Viera has been kidnapped by Elgadad the Demon. An evil spawn of an oddworld astral plane. Tomorrow midnight when the moon is full, she is to be sacrificed in a ritual to bring forth the demon armies to conquer this world. Hesitate not, for the time is precious. Saddle your horse and meet me outside this castle. Your heart will reveal the way to you. We must stop Elgadad and rescue Viera!"